Following the week of Independence Day in 2017, National Day Calendar instituted a weekly celebration of each state in the order in which they entered the union. Today, we recognize Wisconsin, which became the 30th state on May 28, 1848. In 1634, while searching for a Northwest passage to China, Jean Nicolet explored the area. Mining for copper and lead brought Europeans to the region and gave the state its nickname. Wisconsin became known as The Badger State not for the animals but for the habit of miners to build their shelters into the hillsides instead of erecting more permanent homes. Now, Wisconsin is known for its dairy farms and delicious cheeses. Kids will have fun learning about Wisconsin’s largest city with today’s book! Lulu and Pufferson receive a letter from Aunt Fancy inviting them for an adventure. Included are two tickets for the Lake Express to Milwaukee and instructions to go to the Pfister Hotel, where Lulu’s cousin Rocky will be waiting for them. Lulu and Pufferson pack quickly, and in no time they’re aboard the ferry and crossing Lake Michigan. Norman, the doorman at the Pfister, ushers them into the lobby. Rocky is standing in the middle of the lobby, where “there’s gold everywhere and everyone smells like perfume.” He waves and Lulu rushes over and gives him a hug. Image copyright Renée Graef, 2018, text copyright Barbara Joosse, 2018. Courtesy of Sleeping Bear Press. They head out to explore the city. First, they take “canoes from the Urban Ecology Center and see Milwaukee from the river.” All that rowing has made them hungry, so they hit the Historic Third Ward for fried cheese curds that “taste like melted sunshine.” The next day is busy too and includes a trip to the North Point Lighthouse, Discovery World, and the Harley-Davidson Museum. Dinner is rip-roarin’ fun with a fish-fry enjoyed while a polka band plays. The third day is spent at the lakefront peddling a surrey bike and visiting the Milwaukee Art Museum with its rooftop brise soleil—a wing-like structure that opens slowly like a swan taking flight. Lulu says she feels like she’s “riding in the swan! Higher than the clouds! Higher than the wind!” The sculpture and paintings in the museum inspire Lulu and Rocky to paint pictures of their day. The next morning it’s time to go home. Lulu and Rocky give Norman their pictures to remember them by. Lulu and Pufferson board the ferry that will take them home and wave goodbye to Rocky and Milwaukee. An illustrated guide to the sites Lulu and Rocky visited with more information about what there is to see and do at each, plus a long list of even more things they will do on their next trip, follow the text. The title page shows an aerial-view map of the city with major landmarks noted. Barabara Joosse’s Lulu and Rocky are enthusiastic tour guides through some of Milwaukee’s hot spots that offer sightseeing, exercise, music, inspiration, and yummy treats. Sprinkled with a few old-fashioned phrases and references to new-fangled technology, the story is as warm, friendly, and fast-paced as any enjoyable trip should be. Lulu’s observations highlight kid-favorite fun and will entice in readers a desire to discover not only Milwaukee but their own nearby cities as well. Renée Graef’s adorable fox cousins will charm children as they introduce kids to Milwaukee. From the letter that Aunt Fancy sends to the cutaway image of a ferry full of excited travelers to realistic depictions of the city center, lake front, and museums, readers will enjoy lingering over the pages to take in all the details. Humorous additions—as well as Norman’s “wooly bear caterpillar” eyebrows—will also keep kids giggling as they take this enchanting tour-in-a-book. This first book in a new series—the Our City Adventures—will excite children to learn more about areas around the country and what makes them unique. An engaging introduction for young explorers or armchair travelers as well as an accessible resource for teachers. Lulu and Rocky in Milwaukee would be just the ticket to add to home, classroom, and public library bookshelves. Discover more about Barbara Joosse and her books on her website. To learn more about Renée Graef, her books, and her art, visit her website. Kids will enjoy learning some facts about Wisconsin with this printable coloring page. This United Nations-sponsored holiday aims to raise awareness of the crucial importance of mountains to the livelihood and even survival of the world’s population. Covering nearly one-fourth of the earth’s land mass, mountain areas are home to almost one billion people, and over half of the human population relies on mountains for clean energy, food, and water, including 60 to 80 percent of the world’s freshwater supply. Today, mountains are under threat from land degradation, over exploitation, natural disasters, and climate change. This year’s International Mountain Day theme is Mountains Matter, and scientists, activists, and others involved in protecting these unique ecosystems will be advocating for recognition and protection on social media and directly to politicians who can enact change. To celebrate, learn more about the importance of mountains and consider getting involved locally or with national organizations. Image copyright Daniel Miyares, 2018. text copyright Jody Jensen Shaffer, 2018. Courtesy of Penguin Random House. Rocky made a plan, and in the morning he hopped on a pickup truck headed for Arizona to join his cousin The Wave. As soon as he got there, though, a gust of wind blew him away. He landed hard and “noticed that a piece of him had broken off.” Undeterred, he caught a flight with an eagle out to Wyoming and another cousin, The Tower. Rocky was almost settled in when a rainstorm washed him over the side. At the bottom of the long slide down, Rocky hitched a ride on a car bound for Texas. There, he thought he could watch over the sauropod tracks at Dinosaur Valley State Park. But it didn’t take long for an armadillo to dig him out and send him back on the road again. this time he was determined to go to South Dakota. When he arrived, tinier than when he’d begun his trip, he decided that he’d make a terrific souvenir of his cousin Rushmore. Just then he heard the news. The park was closing because a crack had been discovered in Abraham Lincoln’s nose. “Rocky was crushed.” His dreams of being important would never come true now. But looking up at his cousin, he realized that maybe he could help. A passing lizard gave him a ride to the top, and Rocky jumped. He tumbled down, down and right into the crack in Lincoln’s nose. “He was a perfect fit! I did it! I did something important! I saved Abraham Lincoln!” Rocky exaulted, excited and proud. A guide to igneous, metamorphic, and sedimentary rocks, illustrated descriptions of some of the world’s most majestic rock formations, and an Author’s Note about Mount Rushmore follow the story. There’s so much to love about Jody Jensen Shaffer’s A Chip Off the Old Block! Part adventure, part educational travelogue, and completely inspirational—with lots of funny wordplay to boot—Shaffer’s story will charm kids. Little Rocky is a sweetie of a go-getter who has big dreams and sets out to achieve them. He overcomes obstacles, setbacks, and disappointments and adjusts to changes with optimism while never losing heart and building up his self-confidence. Kids will cheer when Rocky finally finds the place where he can make the most monumental difference. Daniel Miyares’ gorgeous illustrations depict the splendor of Rocky’s magnificent cousins and the landscape they dominate while cleverly tracing his journey from state to state, carried along by a truck and a car, in a backpack, and with the help of some animal friends. Rocky is full of personality and childlike expressions that will endear him to readers. Miyares’ full-color, full-bleed pages will get kids excited to learn more about geology and each rock formation, and will no doubt inspire some vacation wish lists. A Chip Off the Old Block is a smart and witty book that will excite a child’s imagination. It would be a terrific addition to home bookshelves and should be included in classroom libraries to accompany STEM, STEAM, and English Language Arts lessons and well as fun story times. Discover more about Jody Jensen Shaffer and her books and find teachers’ resources and activities on her website. 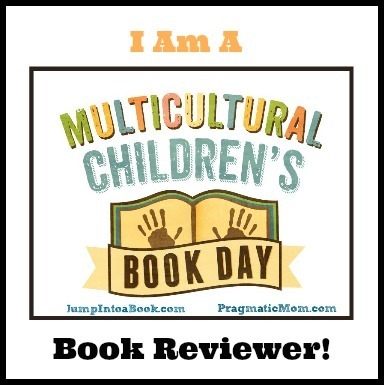 To learn more about Daniel Miyares, his books and his art, visit his website. If you love mountains, you’ll want to find the names of the nineteen mountains in this printable word search puzzle – no climbing necessary! Are you stuck in a rut? Are you so entrenched that you can’t imagine breaking your comfortable routine? Then maybe it’s time for a change. And that’s what today’s holiday is all about. It doesn’t take much to break the monotony—just a simple change-up will do. So today, instead of having your usual latte, order a chai. They’re delicious! Instead of following the same boring route to work or school, zip down a different road. You never know what you will see! And Instead of binge-watching that show, try a new one. I know! But you can go back to it tomorrow. Of course, one of the best ways to break the monotony is by reading books—they’ll take you to all sorts of places, you’ll meet new, exciting people, and you’ll get involved in events you never thought possible! There are birds that fly north and those that fly south. There are birds that take the bus and those that don’t care how they travel just so long as they go somewhere. And then there’s George Laurent. “George never went anywhere.” He told himself that he liked his home and his garden and, especially, the pastries he baked in his oven better than anything or anywhere else. It wasn’t like he never saw anyone. His “friends were always dropping by on their way to somewhere else” to enjoy his delicious treats. And they often invited George to fly away with them. When Penelope Thornwhistle was reminded of the Andes while eating one of his éclairs, she asked George to go there with her. But George had potentially award-winning brownies in the oven. When Walter Greenburg tasted George’s apple strudel and thought about Paris, he was ready to take George to see the city of lights, but George had ironing to do. And a trip to the Alaskan tundra with a flock of other ducks had to be postponed because of yoga class. Copyright Gus Gordon, 2017, courtesy of us.macmillan.com. As time went on, everyone stopped asking George to share their adventures. They knew he was too busy anyway. When winter came, “George found himself alone.” At least until Pascal Lombard came knocking, looking for a place to spend the snowy months. When the bear wondered why George wasn’t sunning himself on some Caribbean beach, George said he was learning Flamenco songs on his guitar, catching up on the TV series Lost in Space, and typing out his memoirs. Well, Pascal was ready to remedy the situation. Fortunately, he had an “uncanny knack for solving tricky problems.” They tried reading books, taking wing on a kite, and using a crane. But nothing worked. “It turned out Pascal Lombard didn’t have much of a knack for solving tricky problems after all.” Both George and Pascal felt disappointed as they read by the fire, until George happened to peek at Pascal’s newspaper and see an announcement for a hot air balloon ride in Paris. George was intrigued. And Pascal said, “‘I am remarkably good with my hands! We can build it!’” So they set to work, but it was harder than they thought, and “it took all winter (it turned out Pascal Lombard wasn’t actually very good with his hands).” Finally, though, they were flying! They flew their red patchwork balloon for months, seeing the Eiffel Tower, floating over the Arctic Circle, soaring through Madagascar, and experiencing places that were “more exciting than they had ever imagined.” But still, they missed George’s homemade pie. So they flew home, enjoyed tea and pie, and planned next year’s “anywhere somewhere else” adventure. Gus Gordon’s tenderhearted and funny story about missed opportunities that can lead to more missed opportunities, excuses, and sometimes isolation tackles a common predicament not often seen in children’s books. George’s amusing tales of loads of laundry, Flamenco lessons, and yoga classes as well as his real talent for baking will endear George to readers, making his admission a moment for true empathy and encouragement. More silliness ensues as Pascal tries to help out, and kids will cheer when the two finally get off the ground. Gordon’s reassurance that there’s no shame in making mistakes or not knowing something is also found in Pascal’s bravado and subsequent asides to the contrary. As George and Pascal work together to teach George to fly, kids see that help can be as close as a good friend—and as fun. A welcome undertone to the story is the idea that it’s also okay to be yourself: the first page abounds with very unique birds flying here and there; for Penelope an éclair reminds her of the Andes and for Walter, strudel reminds him of Paris—and who’s to say they’re wrong? ; and when George and Pascal miss home and homemade goodies, they return to their favorite place. Gordon’s illustrations are a treat too. Full of visual humor and word play, the mixed-media, collage-style images bring together snippets of old advertising, photography, and traditional mediums and invite readers to linger to catch all the humor included. The page on which George finally makes his confession is worthy of special note. Here, in contrast to the other pages, the background is white, a saddened George is simply sketched with a blue outline, and the stack of firewood he was carrying lies haphazardly at his feet. The image gives children and adults an opportunity to talk about feelings of embarrassment, doubt, or uncertainty. Somewhere Else is an original story with heart, humor, and an uplifting lesson that would make a sweet and meaningful addition to classroom and home libraries. Discover more about Gus Gordon and his books on his website. One of the best ways to add excitement to life is through reading! These kids are waiting for some books to read. 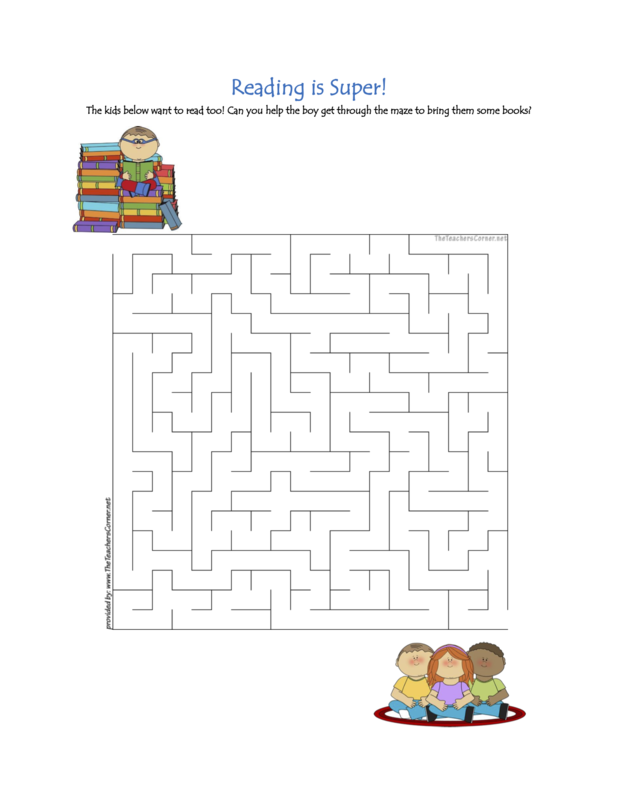 Can you help the super-reader bring his friends new books in this printable Reading is Super Maze? Today’s holiday recognizes the importance and beauty of the rock that forms solid ground under our feet and soars majestically to meet the sky. From earliest times, rock has been used as building material—and even the tools to build with—and has provided us with valuable gemstones that beautify our lives. Geology and archaeology are just two of the sciences that explore the wonders of stone—what it is composed of and what secrets it keeps. Today, be more mindful of the rocks around you and take a closer look at the intricate patterns that lie within them. Carol Otis Hurst tells the story of her father, who—even when he was a boy—loved everything to do with rocks. He collected them and in his spare time walked “along stone walls and around old quarries, looking for rocks.” Everyone said “he had rocks in his pockets and rocks in his head,” and he had to agree. When he thought about what he wanted to do when he grew up, he imagined it would have something to do with rocks, and when he was told “‘There’s no money in rocks,’” he was okay with that. In the end, though, he opened a gas station in Springfield, Massachusetts with his father’s help. He called it the Antler Filling Station. Image copyright James Stevenson, 2001, text copyright Carol Otis Hurst, 2001. Courtesy of Greenwillow Books. Most people in town said he “had rocks in his head” if he thought he would sell all those parts, but pretty soon drivers were flocking to the Antler Filling Station for gas and fixes to their cars. They also came inside to see the rocks, ask questions, and hear the stories of each rock and gemstone. Then the stock market crashed and people didn’t have the money for gas or to fix their cars. Things slowed down at the Antler, and when things were really slow, Carol, her father, and her friends would pile into their Model T and go searching for more rocks. But while the collection at the filling station grew, people stopped coming because they were all out looking for jobs. Soon the Antler Filling Station closed and the family had to move to a new house. The house was falling apart, but Carol’s father began repairing it—after building shelves in the attic for his rock collection. When he wasn’t repairing the house, he was studying more about rocks. Along the way, he looked for work, taking any job he could even if they only lasted a day or two. On days when he had no work, Carol’s father went to the Springfield Science Museum, where “they had a whole room full of glass cases containing many rocks. Sometimes he’d spend the whole day in that room.” One day, he met a woman who asked him what he was looking for. He answered “‘I’m looking for rocks that are better than mine.’” Out of the hundreds of rocks in that room, he told her, he’d only found ten, “‘maybe eleven,’” that were better. They smiled at each other. Then the lady introduced herself as Grace Johnson, the director of the museum. “‘These rocks have come from all over the world,’” she told him, and he said that his had too. She wanted to see his collection, and so they drove out in her big car. Carol’s father showed her up to the attic. After looking around, she told him that while the board of directors wouldn’t allow her to hire him as a mineralogist because he lacked a college degree, she did need a night janitor. When he heard that the job sometimes included cleaning rocks, he took it. One day, Mrs. Johnson discovered him correcting a label on one of the rocks. She smiled and told him that she had told the board of directors that she needed “‘somebody with rocks in his head and rocks in his pockets.’” Then she asked, “‘Are you it?’ Maybe I am,’” Carol’s father answered. “‘Maybe I am.’” And he was! Carol Otis Hurst’s lovely and affectionate memoir of her father offers young readers a snapshot of history while introducing them to a man who stayed true to himself and his life-long love of rocks despite obstacles and good-natured jibes by those around him. Hurst’s easy-going, conversational storytelling represents her father well, allowing children to get a feel for his personality and steady outlook on life. His acceptance as a mineralogist (and ultimate position as director of the Springfield Science Museum as told in the author’s bio on the jacket flap) will satisfy readers. James Stevenson’s familiar watercolor-and-ink illustrations are infused with charm, taking children beside an old stone wall that meanders through the woods, back to old-style filling stations and Model-T cars, and into the heart of a true collector. Images of the author’s father attentively setting up his collection in the filling station and later in the attic will resonate with any young collectors reading the book, and the full-page illustration of Grace Johnson and the author’s father talking and smiling together is happy validation that kindred spirits do cross paths in life. For children who love collecting, history, museums, and biographies, Rocks in His Head is a delightful choice for home libraries and would make am appealing lead in to science lessons or museum field trips for elementary classrooms. Smooth stones can give you a natural canvas for your creativity! With a little bit of paint, pins or magnets, and some imagination, you can make refrigerator magnets, jewelry, paper weights, and more! There’s something about trains with their click-clack rhythm and plaintive whistle that endears this mode of transportation to adults and kids. Today’s holiday honors all the mystery and romance of train travel while also remembering the history of the railroad and its importance to the development of the United States. The holiday was once sponsored by Amtrak, but train lovers across the country are keeping it on track. To celebrate, visit a train or transportation museum, take a short trip on your local commuter rail, or even plan a vacation trip by train. In the darkened forest cut by train tracks, the train approaches. Its headlight shines and its wheels “rumbling, grumbling, screech and squeal.” Without stopping the train continues “puffing, chuffing, never yawning. / Climbing hills as day is dawning.” It never sleeps but hurries on to each station on its route, picking up passengers from small towns and big cities and letting them ride to their destination. Image copyright Deirdre Gill, 2017, text copyright Andria Rosenbaum. Courtesy of HMH Books for Young People. Through all kinds of weather, “in rain or snow, / trains will trudge and go, Go, GO!” When cars and trucks are stuck in jams, trains zip past. “Trains don’t sleep—they need to lead. / Roaring, rushing, gaining speed.” Trains don’t stop at traffic lights, but make cars wait as they go by. The circus train is always welcome with its cars filled with tents and animals and performers. An illustrated look at different kinds of trains and train cars follows the text. Andria Rosenbaum’s lovely story is part tribute, part lullaby as it takes readers on a lyrical journey cross country on passenger and freight trains. Her refrain “trains don’t sleep,” focusing on the dependability of trains as they chug along day and night over all terrain and in all weather, can also be read as a homage to a parent or caregiver’s love which, likewise, “never sleeps.” Rosenbaum’s sparkling rhymes beautifully convey the dichotomy of a train’s movement that seems to thunder through the daylight hours while slipping tranquilly through the night. Deirdre Gill’s gorgeous illustrations depict locomotives with tender affection and all the excitement train travel offers. Gill’s use of various perspectives—from a train’s approach from afar to its accepting passengers at the station to an aerial view as it snakes along winding tracks—provides all the mystery, majesty, and pleasure that this favorite mode of transportation provides. Throughout, Gill’s color palette and choices of scene, architecture, automobiles, and even clothing fuse the past and present to create a fully realized look at our love of trains. Delightful from beginning to end, Trains Don’t Sleep is a heartfelt and heartening story for bedtime or story time, and would be a favorite of train lovers and any child with a bit of wanderlust in their soul. To learn more about Deirdre Gill, her books and her art, visit her website.